My name is Glen, I’m 34, and I’m visually impaired with aniridia and nystagmus, and I’m writing about my experiences at Well Eye Never. Last Christmas I moved to London from Devon. I was already comfortable with the crowds and finding my way around, because I’ve visited London many times before. And technology helps with navigation now too. But my big worry was socialising. I didn’t know anybody in the city, and I was going to become a homeworker for my Devon employer. So I realised I could become very lonely and isolated if I wasn’t careful. In the past, friends had come naturally through school and work, whereas now I had to do it from scratch. And that felt very daunting, as I can be quite shy, and I didn’t know if my disability would put people off. But I had to try, though I didn't know how. So I turned to the internet, and did a lot of research before the move. And I discovered a variety of possibilities that I wanted to explore. To begin with, I found companies like Meetup and Wonderush, who organise hosted social events for all sorts of interests, designed to bring strangers together. Not for dating, just to have a good time. Plus there are groups for visually impaired and disabled people as well. So I joined a couple of groups – Thinking Bob (a non-disabled community) and East London Vision (for the visually impaired) – because they looked easy, safe and fun to get involved with. I was very anxious at first, of course. But everyone is there for the same reason – to meet new people and enjoy themselves. Nobody goes along to be on their own. So it's been quite easy to get chatting to people. And I’m having a great time at the events, including game nights, walks, museum tours, restaurant outings, etc. I’ve also been on audio description and touch tours at museums and theatres, with the charity VocalEyes. That may not sound relevant, but they’ve also proven to be very social, as you get chatting to the other visitors. 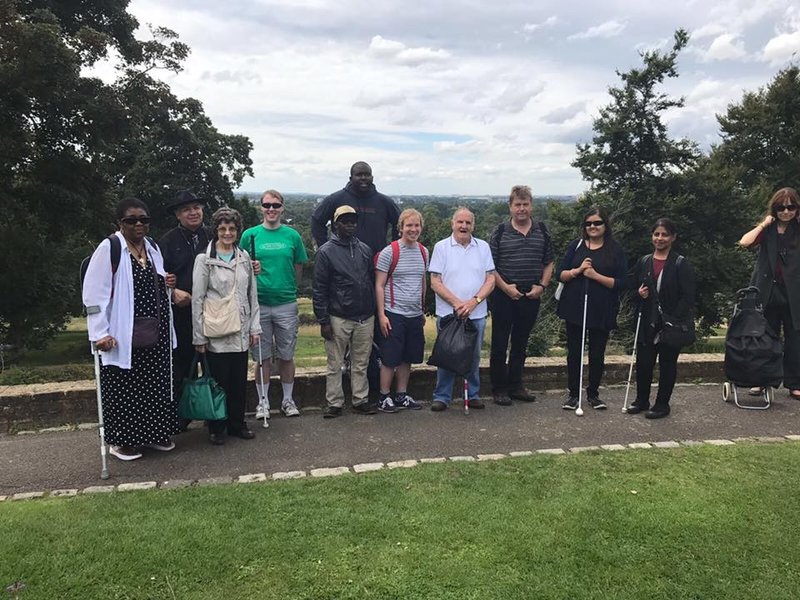 I’ve already made a few friends who I’ve met up with later as a result, and joined another visually impaired social group – South East London Vision. So they were unexpected bonuses. 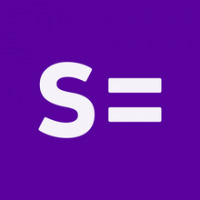 And on top of all that, I’ve been having a go at blogging and video-making, as I discovered how many disabled people were doing it. I was nervous, yet I thought it might help to make one or two online friends and find information and advice, as I get chatting to people. But it's gone much further than that. It’s led to real-life friendships and meetups, including trustee James from the Aniridia Network and Emily from the Fashioneyesta blog, plus I've made guest posts on other sites and even given my first ever public talk. I hadn’t anticipated any of that, but I'm very grateful for all of it. All of those things may sound easy when written like that, but they’ve taken time and effort to develop. Researching groups and events, plucking up the courage to go to them, and forming new friendships, all take a little while. But it's been well worth it, it's given me a huge confidence boost this year. So my general advice is to take your time looking around to find things that interest you, and any support you may need to do them. Search the internet, browse sites like Meetup, get advice on social media and forums like this, explore and interact with the blogging community, contact disability organisations and any social groups you find, talk to family and friends, etc. There will be things you can do and people you can meet, both online and in the outside world, so it’s worth the effort to find them. Then, when you do find something that you feel is appealing and accessible, give it a go. I know that’s easier said than done, and you may need to try more than one thing to see what works best for you. But don’t give up. The first steps are always the hardest, but once you start to get involved and people get to know you, your confidence will grow. And the results over time can be surprising – they certainly have been for me this year! What do you think of Glen’s story? Do you have any tips for socialising in an unfamiliar environment? That's really interesting. Thanks! Are those groups you mentioned quite London - based or have they found their way up North? Thinking Bob is London-based - they are looking to expand to Manchester and Bristol/Bath at some point in the future, but there's no timescale on that to my knowledge. Meetup is nationwide, however, that has groups all over the place for all sorts of things. The visually impaired social groups I've joined are London based, and are under the umbrella of the Thomas Pocklington Trust. But I would hope there are some social groups for people with sight loss and other disabilities elsewhere in the UK. VocalEyes offer audio described and touch tours at museums, galleries and theatres across the UK, not just in London. 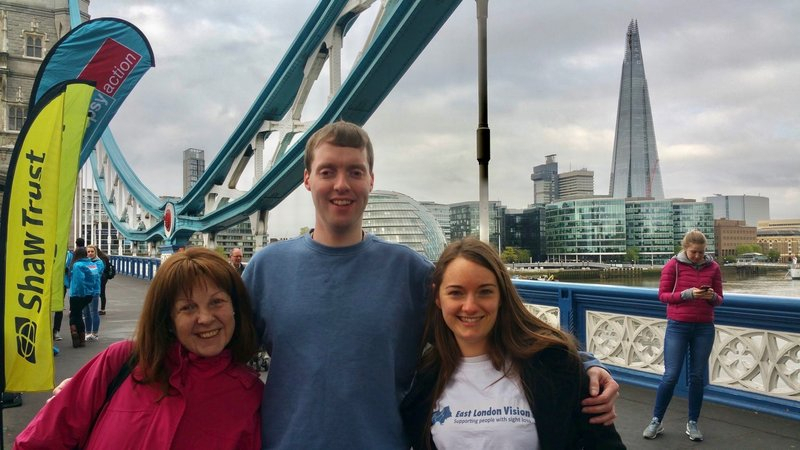 Charities like the Aniridia Network and Nystagmus Network are also UK-wide, although generally the only chance you get to meet other people is at annual conferences and awareness days, or by interacting online of course. You don't generally get a lot of meetups otherwise. That said however, members are more than welcome, indeed encouraged, to arrange get-togethers themselves in their area if they wish, which the charities can help to organise. It sound like the step of moving to London was very beneficial to you. Congratulation. Thanks @iza. I'd always wished I could live in London, but never thought it would be possible, and it was never in our family's plans for various reasons. But when things changed unexpectedly and the opportunity presented itself, we grasped it. And we're very glad we did! Thank you, Glen, for your invaluable contribution to the Nystagmus Network's annual open day in September. Keep up the good work! Thanks @nystagmusmum, it was my pleasure to do so. Giving my first ever public talk was one of the most interesting and enjoyable challenges of the past year, I'm glad it went down so well with your members. Meetup is great, and free to join for most groups (some have a yearly membership fee. I actually left London 6 months ago, and it is isolating, there's also a lot of domestic stuff to sort out, changing addresses, registering for healthcare, utilities, any emergency measures etc etc. That takes a lot of time so its essential to keep something of a social life. Me and my partner have used meetup previously, there' many may more meetup events in London then than here in the Midlands, but we've managed to get to a few, and gradually building up a new network of friends. It does take time, and some effort. I miss the frequency of transport, but then again London is mentally challenging, and often expensive. I've also found looking for social groups on Facebook quite good, if you do social media, again free. And can recommend the Outsiders.org.uk lunches in London and around the country. Very friendly and accessible. I have found and joined a social site for the over 50's. Personally I only really use the forums but there are chat rooms and an associated dating site which I am told are both quite good. The people are predominantly healthy though most over 50's have some issues. It gives me an outlet that FB doesn't provide and certainly doesn't have the "I must post only what people like" attitude of the young.